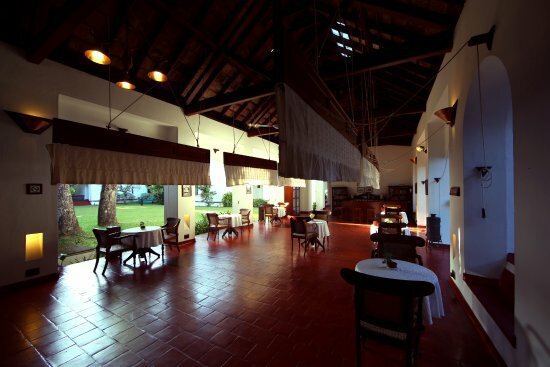 The Brunton Boatyard - Kochi in all its Colonial glory! The Brunton Boatyard - Kochi in all its glory! Located in the bustling port city of Kochi, the Brunton Boatyard at Fort Kochi neighbourhood is the site of the first permanent European settlement in India. This is what makes it feel so fitting even though the building is a modern edifice equipped with all the luxuries and frills, required for a grand vacation. The hotel is close to most of Kochi’s historic sites and tourist attractions, which are well worth seeing; guests can explore the area by riding on complimentary bicycles provided by the hotel. Perched at the tip of a peninsula where the harbour joins the Arabian Sea, The Brunton Boatyard, as the name implies, sits directly on the water and has a commanding view of Kochi’s busy waterways. If one should ever tire of looking out across the water, however, the hotel itself is spectacularly striking to behold. The hotel reflects the influence Europeans have had on India. The building captures the essence of colonial architecture beautifully. The design of the building is a blend of Dutch, Portuguese, and British influences—all three of whom occupied the important trade post of Kochi at one time or another. Together, these three styles combine to form a remarkably handsome building. Its white walls, colonnades and balconies give it a stately appearance. One could spend all day admiring it from the garden or on the patio while sipping tea—the hotel particularly prides itself on its selection of fine teas. The grounds of the hotel are likewise ‘prim and proper’ as one would expect. A carefully manicured lawn and an elegant garden filled with rain trees insulate the hotel from the outside world quite nicely. The garden makes for a delightfully cool and shady place to relax while taking in the afternoon air with a gin and tonic. The interiors of the hotel are no less dazzling than its exterior. Wooden furniture and wooden cross-beams in the ceiling combine nicely with the red floor tiles, white walls and arched windows. Inside the guest rooms, the furniture and décor perfect complement each other. The four-poster beds scream comfortable living; all the furniture, from the chairs to the armoires is made of teak. Though the hotel may be deliberately trying to cultivate an ‘old fashioned’ look and feel, which it does marvellously and with great charm—guests want for nothing when it comes to modern comforts. 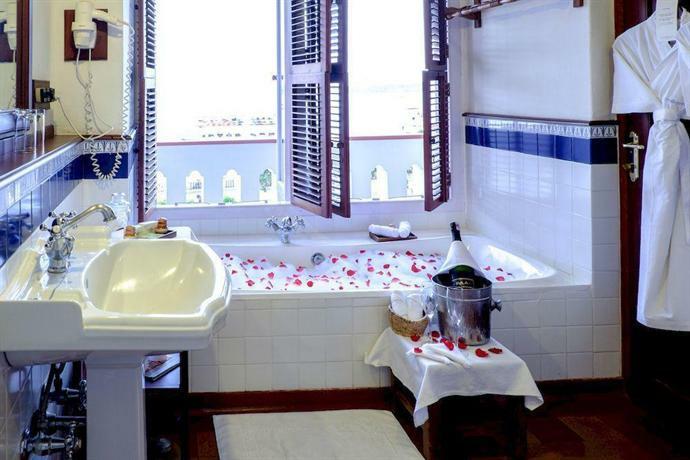 The guest suites, for example, are all air conditioned and have a tub with a view that faces the sea for those who want to soak in the view. A safe, mini-bar, television, and complimentary Wi-Fi round-out the luxury experience. The facilities are uniformly fresh and the fittings positively gleaming. And as if it could not get any better, every room comes with its own patio or balcony. The amenities aren’t restricted to the guest suites though. The hotel has all the amenities worthy of a luxury resort. Fitting for a luxury hotel, massages are available, with ‘healing herbal massages and relaxing therapies’ to help relax guests. The swimming pool is phenomenal, perfect for cooling off after hiking around the town. Located between the hotel and the sea, it is open year-round—even during the monsoon season! The hotel also has an office centre with computers and printers for those who can’t completely get away from work. And for those who never take a vacation from staying active, there is a fully-equipped fitness centre. As one would expect of a luxury hotel, the dining options are first-rate and offer an array of options. There are three restaurants or bars in The Brunton Boatyard, though the patio grill does close during the monsoons. The Armoury Restaurant and bar is a spectacular place to grab a bite or a drink. The walls are adorned with historic Indian and European arms and artwork. The food, too, is part of the experience. 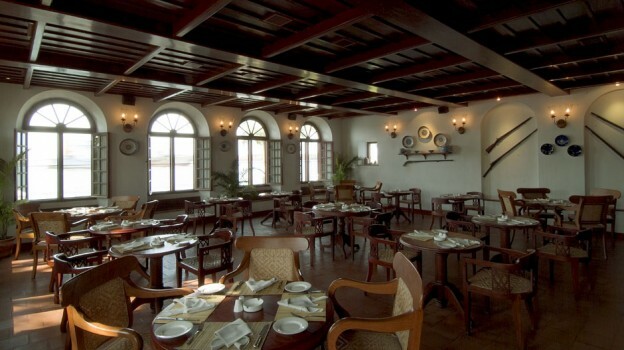 The cuisine reflects the many different cultures which have impacted Kochi through the centuries---Christian Syrian, Dutch, British Raj, and even Jewish cuisine is on the menu, as are dishes native to Fort Kochi. The ‘Railway Curry Mutton’ which the chef particularly recommends was invented by Anglo-Indians living in Fort Kochi. The hotel even offers a cooking demonstration, enabling a guest to bring home a part of Kochi to one’s own kitchen. Everything about The Brunton Boatyard has the feel of ‘the good life’. No matter where one looks, one sees either incredible views or lovely furniture. No matter what one is doing, whether it’s basking beside the pool, taking tea in the garden, or sitting on a balcony staring out at the Arabian Sea, The Brunton Boatyard perfectly encompasses the luxury resort experience. It lacks nothing. It has the views, it has the atmosphere, it has the look, and it has the wonderful experience!